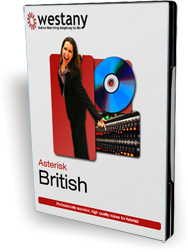 English voice prompts for Asterisk, AsteriskNow, Trixbox, Callweaver, Elastix & FreePBX®. Why leave your PBX speaking American English when you have access to our professional voices in many English languages. With a simple installation you get the benefit of a professionally trained voice artists representing your company. After all ‘the first impression counts’.